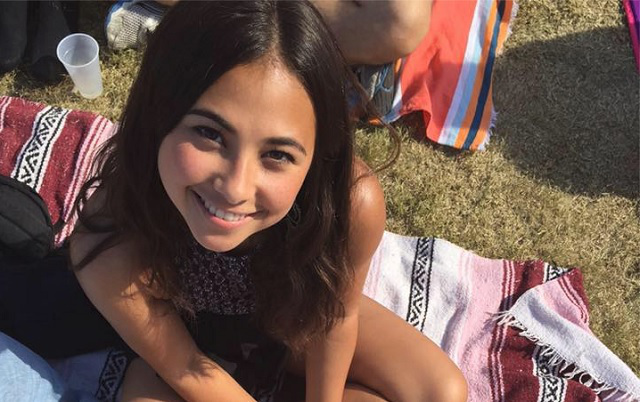 AUSTIN --The bodyfound in a creek Tuesday on the campus of the University of Texas at Austin has been identified as missing first-year dance student Haruka Weiser, and police are calling an unidentified man seen in surveillance video a suspect, university officials and Austin police said at a press conference Thursday. University president Gregory L. Fenves made the announcement in a letter to students Thursday, calling the crime "horrifying and incomprehensible." "The unthinkable brutality against Haruka is an attack on our entire family," Fenves wrote. "Law enforcement is fully engaged to do everything to bring the perpetrator who committed this crime to justice." At the press conference, he said the murder was "every parent's worst nightmare." According to CBS affiliate KEYE, the University of Texas police department responded to reports of a body in a creek on campus west of the Alumni Center at 10:46 a.m. Tuesday morning. Police said Thursday that the woman, 18, had been a victim of a homicide and had been assaulted, but did not detail her cause of death further. Police are asking the public for help in identifying a man they're calling a suspect who was seen on surveillance video in the area Sunday night. Officials played the video Thursday, which shows the man walking a bike on the north side of the school's Darrell K. Royal Texas Memorial Stadium, about two hundred feet from the alumni center near where Weiser's body was found. Weiser was last seen leaving the campus drama building between 9:30 and 9:45 Sunday night, said assistant chief Troy Gay of the Austin Police Department, which is leading the murder investigation and working with University of Texas police and federal and state investigators. Gay said Weiser communicated with one of her friends and was headed back in the direction of her dorm. "She never made it to her dormitory that night," Gay said. Weiser's roommates called university police and reported her missing around 11:30 Monday morning, he said. Campus police tried to find her by talking to roommates and friends. On Tuesday, Gay said, police conducted a more thorough search of the campus and found her remains in the creek. Gay said the suspect was seen shortly before ten o'clock on the video, and then again a little after 11 p.m. He was seen walking a red or pink woman's bike. Investigators believe he was in the area "at least a couple of hours." He said police haven't recovered a weapon. Gay said he hoped the public "will step up, as they do in every case, and help us identify who the suspect is." He asked students and faculty to remain vigilant until the suspect is arrested. Fenves said students "expect and deserve to be safe" and announced that the state Department of Public Safety would conduct a safety and security review of the campus, which would include an assessment of video monitoring, outdoor lighting and building security. He said the university will also expand its SURE Walk program, a student-run program that provides two volunteers to walk with students or staff to their destination on or off campus. The campus is seeing increased patrols by law enforcement including the state Department of Public Safety and the Texas Rangers and grief counselors were made available for the campus community, he said. Weiser, a native of Portland, Oregon, was recruited to attend the university after dance faculty saw her perform more than two years ago at the National High School Dance Festival, according to Fenves. Fenves called her a "beloved member of our dance community, liked and admired by her classmates and respected by professors for her intelligence and spirit." Weiser was trained in ballet and was active with Dance Action, a student-run organization for dancers, performing in the group's fall concert. "Our university was made better by her presence, even though it was for such a short time," he said. In a statement read by Fenves Thursday, Weiser's family expressed their grief and their thanks to the campus community for their support. "We will forever miss her. The pain of our sudden and tragic loss is unfathomable," the statement said. The teen was dance major and was considering a second major in pre-med, family said. She had plans to "explore the world of medicine this summer and travel to visit family in Japan." Despite her love of performance, her family said, she never sought the spotlight in her daily life and "perhaps the last thing she would want is to be the poster child for any cause." "As we struggle to understand why she was killed, if her death can somehow make it safer for a young woman to walk home ...or prevent another assault or murder, at least we can find some meaning behind this senseless and tragic death," family said. They remembered Weiser as a "passionate and dedicated dancer and student." "She was so happy to be a student at UT," they said. Anyone with information about the murder is asked to call the tipline at 512-974-5372. A reward of up to $15,000 is being offered for information that leads to the identification and arrest of the suspect.